In a piece of journalism that deserves the Pulitzer or at least an immediate Howitzer , New York Times comes up with a totally serious, dripping with analysis feature on the “Mere Paas Maa Hain” Nirupa Roy syndrome in the charming Slumdog Millionaire “Chamma Chamma” reporting style that we so admire, with the only criticism one can make of it being that it was published on April 3, 2 days too late for All Fool’s Day. There are nuggets of wholesome “teri ungli pakadke chala” motherly goodness everywhere in this article that exposes India’s infamous mama’s boys (I am not one of them however and this my mother assures me). Yes those mama’s boys that call their mother in India (gasp) everyday and those who even though they may be on the wrong side of 40 consider (double gasp) their mother to be their favorite person. Happens only in India. However the most glittering insight into the bizarre “Maaa main tera laadlaaa” national obsession may be the one below. The veneration of the mother in India has a long history, rooted in part in Hinduism’s powerful female gods. The country is often referred to as Mother India. Nearly every Bollywood movie features a strong mother character in a leading role. No one can one forget a legendary song from Akhiri Rasta:). Son: Why I am so dark? Mother: I don’t know go and ask the buffalo. Buffalo replies: tune mera doodh piya hai. tu bilkul mere jaisa hai :). Public in Cinema Hall: “Aur tu maa ka doodh pi ke maa ban gaya. 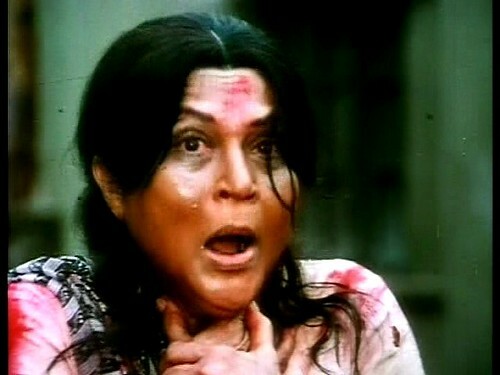 Remember that dreadful film with the same name as your article where even a snake does not forget how Aruna Irani saves it from starvation and therefore takes part in the revenge drama as due to the ‘karz’, it has become a sibling to Jackie Shroff!. Can someone pass on the VHS to the writer? Then, may be there will be a new PETA twist to the tale. Or Aruna Irani will be featured along with Pamela Anderson in the posters! lol.. this is so true, thoroughly enjoyed reading this..
And I was thinking why don’t woman like Hament Karkare’s wife step up and tell Shiv Sainiks that her husband indeed is worthy of respect because he kept his duties above his life! ‘Its a dent in respect for Mumbai martyrs and what they stood for if you throw stones at Anjali Waghmare’s house! Change the law if you think its not suited rather than protesting against the repercussion of law!’ And so I would bow down in front of her! Woman empowerment?? Sure! When Younus Khan placed his micro-financing policies his focus was to give credits to woman as she is more wiser in spending money compared to his inebriated husband makes lot of sense! NOT like tribal women sympathizing with naxalites as offshoot of Woman Empowerment!! You Indianss aahr so funny! Those Germans call Germany faathuhrland. I wondehr what they drink? Yup, but what’s the big deal? What a bizarre statement…what does that have to do with anything? And I also do not get what the point of the whole NYT article is. What’s the big deal if people turn to their mothers for support? One won’t expect someone to turn to their neighbour’s mother for advice and support now would they? No joke. Even today, like Mother Dairy, the largest supplier of wisdom and free advice in India is the MOTHER-IN-LAW! Greatbong….its Nirupa Roy and not Nirupama Roy. Siddharth…its Mohammed Younus and not Younus Khan. I am a woman on the wrong side of 40 and my mother is still one of my favourite persons!In fact, the older I get the more I am able to appreciate her for what she was.And no, I did’nt call her everyday.She passed away a few years ago.I rather wish I did. I guesss you people will find this funny too. DNA goes a step further. I dont understand why does Infosys creep into every damn article on every topic under the sun concerning India! Let me request people including Joyjit to please honor the TOS. Do not plunk in links to anything that has absolutely nothing to do with the topic being discussed. If you have something you want to bring to my notice *email* it to me. Thank you. Funny! My question is why is the NYT even publishing such over-generalized articles on Indian Culture for Tourists 101. Maybe that reporter has a licence to write whatever her observations are without any sort of editing. That is why you see analogies like the Mother Dairy one. LOL. All! hah. I laugh when people make sweeping statements about a billion strong population. Remember the “Competitive Mother” sketches from Goodness Gracious Me? That’s how twue Desi Moms stick to their betas! So there, white devils! But then them Goras have the redoubtable Jewish Moms,right? And they really know how to make you appreciate them…. 4. India has the largest Film Industry in the world . Yeah and tommorow they will publish a historical study which is the result of great investigation and analysis which will prove that even th Mother Goose Nursery Rhymes originated from India. Actualy, expecting the ‘born again’ and ‘re-discovering abstinence’ people to understand family ties is little difficult. Because, the psychiatrist is the most trusted ‘member of the family’. People who are readily recoginising and defining newer concepts of what a family, relationship, marriage should constitute, should therefore refrain from passing judgement about a more stable and ‘alien’ concept just because no one from West is yet to ‘sanctify’ it as yet. If there was this NYT best seller book on ‘Chicken soup your mother tupperpacked after you sold your ferrari therefore losing friends and alienating people’, am sure these people will sit up and agree. No wonder much is spoken about helthcare, specially for the elderly as the children are never there. Even the Jewish mother jokes are in the same spirit. Can we have your list of the best Maa films? One of the contestants from the Miss India paegent this time even said that despite sounding cliche, her inspiration always is and will always be her mother. If the writer had spoken to the women population, she would have discovered that even the women of India are very connected to their mother, (barring offcourse the Bengalis, where the Babas are more favoured and daughters have rather endearing nicknames like ‘Maa-moni’ etc.) and giving a more ‘positive’ look making India as a country of Maa-worshipers and therefore this love transcending into love for the motherland!! Much like the UP CM , who has become the mother to all, after facing some verbal challenge from Maneka Gandhi. But knowing how the West reacts, this writer will be writing the second article on the Saas Bahu. And quote Ekta Kapoor, Maneka Gandhi and Barkh Opinionated Dutta and not to forget Brinda Karat and Arundhati Roy. Bcoz they’r insecure fuckwits who can’t put their arm around their best friends lest ppl think theyr gay… and cant call their mom lest ppl. call them mama’s boy.. Honestly, I didn’t find this funny. Nor did I think the article warranted a blog post. Calling up one’s mother everyday does not make a man less so. Will calling up girlfriends and wives warrant the same response or is it more a sign of masculinity? Sorry Arnabda, ami tomar shathe ekmot noi. Outside of a tiny minority of Northern European countries and the US, mother love is all pervasive. Italians are notorious for Mama love. I had a friend from Napoli who would get all misty eyed remembering how Mama back home would make fresh pasta in her kitchen every day. No one cooked better than his Mama and no one was more dear. Ahem..,my significant other is Greek and calls his mother every single day (hopefully he doesn’t read this blog). Korean-American guy in my class gulps down some awful tasting herbal drink every single day because his “Umma” said it was good for him. The most notoriously crazy living, gambling, smoking, surviving on a diet of Pepsi and alcohol Persian boy I knew became a meek and obedient lamb when Maman came to visit. Even in the US, outside of ethnic minorities I’ve seen many Mama’s boys. I don’t think the article meant to mock anything – perhaps a bit of gentle ribbing, that’s all. What an apt picture for the article…and thanks for linking the article, da, lovely. Honestly, that writeup seems bent on presenting our country not as a fast developing competitor, but as a large travel brochure…this only leads to further misconceptions about India, and Hinduism, read Wendy Doniger’s works for more…it is almost as if the Occident is afraid to see the speed at which India is developing, and chooses to anesthetize itself with images of Mother Gods and slum dwellers. The Occident has always been intrigued by Eastern civilizational features, sometimes stereotyping them (often wrongly), to the hilt. Most often it is less because of any malice or prejudice and more out of an exxagerated sense of “categorizing” the West and the near East has been accustomed to, because of their uni-demensional Islamo-Christian history. It is anybody’s fault. It is just how thought processes effect mindsets. Having said that, we have to also remember that we are partly to blame for their lack of knowledge. -How many of actually have the intellectual gumption and scholastic training to logically argue with “Hindu bashers” like Wendi Doniger and the tons of her likes. -How many of us actually know enough of our own history and its philosophical wealth, so as to carry on an effective argument on Hindu Darshanas? All we do is sit and hope, that everyone in this world will stand in gawking awe of our “magnificient civilization” and our “newfound economic prowess”. Well stereotypical opinions take time to change, and my friend, it helps if due deligence is done to effect that. I am a guy who is 30 and i also call my mom every single day of my life.. I consider her my best friend.. What is wrong with that? What is wrong with the fact that i still like to be pampered by her? huhh.. I did not write the previous message. Dude… What have you been smoking to be so scatter-brained? Bringing in Infosys in irrelevant topics..sheesh. And why do you write under Stewie’s name? Is it because you are a Stewie wannabe? Can you tell me why are Infosys people supposedly knowledgeable about every bloody topic even remotely connected to India? Especially in the english media in the country and some out of it. Excellent article that really was! Absolutely true.. rt?? but that was just the Indian side.. what they did not include was the American side of the story. They too are obsessed to mothers.. a bit differently though: M.I.L.F !!! doesnt it mean every American son goes abt $$!$%&@$%…………. then??? but on the brighter side that made my day 🙂 LOL!!! Okay, that was a bit over the top. But how about Indians talking about the nuances of American social life. Dont’ you think when cultures look at each other from the outside, with preformed perspectives deeply engrained in the brain, opinions are bound to be biased in some ways. The good thing,though,is that it gives one a chance to retaliate, a chance to debate on the issues, which will,hopefully, atleast allow some to get the right picture.